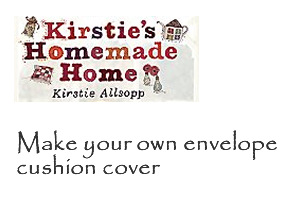 How to make your own envelope cushion covers? Why not match your sofa cushion cover with your fabric door stops and harmonise your interior design – and go bold with bright colours! Mix floral and stripe cotton fabric patterns to create timeless designs brightening your house during dark and rainy days. Measure out the fabric. You need a piece of fabric 2 ½ times the length of the cushion, by the actual width of the cushion, plus an extra 5 cm on all sides for hemming or turnings. Cut out the fabric. With the wrong side of the fabric facing you, turn over 2.5 cm at each end of it, then turn over again to enclose the raw edges. Pin these double hems in place and press flat, then machine using a straight running stitch. With the right side of the fabric, facing you, place the cushion pad in the centre of it. Fold the hemmed ends of the fabric over the cushion – this creates your envelope. Use pins to mark the overlap. Remove the pad and pin the unhemmed edges together, keeping the overlap in place. Machine stitch along the 2 edges, 2.5 cm from the outer edge. Remove the pins. Neaten the edges by trimming to 1.5 cm then machine the edges with a zigzag or overlock stitch to prevent fraying. Turn the cover right side out. Press and then insert your cushion pad. If you like, you can add a couple of buttons to the cushion, purely for decoration!